The Bell TPL Fund is a $1 million, multiyear initiative that provides annual grants of $5,000 to $75,000 to community mental health programs for serving military members, Veterans and their families. A thousand Canadian military personnel are medically released each year, with 40% of them returning home with psychological injuries. Since its launch in 2013, the Bell TPL Fund has provided 89 grants to organizations across the country that work to improve access to mental health care. In 2016, it was announced that Bell Let’s Talk and True Patriot Love’s partnership would be extended for another four years, providing an additional $1 million in support of the mental health and well-being of military families. The Bell TPL Fund provides annual funding. The grant year starts on October 1 and ends September 30 of the following year. The Bell TPL Fund may provide a grant amount for less than that requested. When this happens, the grantee must submit a revised budget within the amount approved. An interim impact report and/or final impact report are mandatory for the Bell TPL Fund. Visit Bell Let’s Talk or, for more information, please contact us. 4 Wing Military Family Resource Centre Society: The Applied Suicide Intervention Skills Training (ASIST) workshop is an interactive program that helps members of military families identify signs of suicide risk and learn suicide intervention skills. Calgary Science Centre Society: Weekend, age-specific mental health workshops will provide parents and children of military and Veteran families with support and help them develop skills to manage stress, de-stigmatize mental illness and build resiliency skills. Esquimalt Military Family Resource Centre: Mental health-related podcasts will fill the gap for those who do not live close to a Military Family Resource Centre or may be limited in their ability to attend programs in person. Gagetown Military Family Resource Centre: In the 13-week Parenting the Child With Oppositional Defiant Disorder program, families are supported with improved parent knowledge, resourcefulness and a reduction in mental stress, leading to improved family relationships. Greenwood Military Family Resource Centre: Deployment services provide a practical kit filled with supplies, inspiration and information on community mental health resources for spouses of Canadian Armed Forces members who have been deployed for at least one month. This program will augment the other deployment services and the pre-deployment information package offered by the centre. Legacy Place Society: The evidence-based Mental Health First Aid course helps correctional officers, probation officers and sheriffs with a history of military service develop crisis first aid skills. Mood Disorders Society of Canada: Veterans in the national, 2-day Peer and Trauma Support Systems (PATSS) program will earn a certificate in evidence-based peer support training. Outward Bound Canada: The Bay of Fundy Veterans’ Course is a week-long wilderness resilience program designed to help Veterans face the challenges they may encounter both during and after transition from a military career to civilian life. Veterans participate in peer-supported healing and self-discovery activities in the Canadian outdoors. Pacific Assistance Dogs Society: Under this pilot program, trained and certified Post-Traumatic Stress Disorder (PTSD) service dogs will be matched with Veterans living with Operational Stress Disorder (OSI). Petawawa Military Family Resource Centre: Through a suite of wellness clinics, both adults and youth of military families will receive comprehensive mental health support to address challenges related to deployment, parenting, transition and other relevant topics. Prince’s Trust Canada: The Modified Mental Health First Aid course provides training for volunteer business mentors in Prince’s Operation Entrepreneur’s business bootcamp for Veterans. Quebec Veterans Foundation: Therapeutic interventions delivered by professional therapists relieve stress, lower depression, increase self-acceptance and provide a sense of belonging. Activities include music therapy, pet therapy and yoga/mindfulness sessions. Roots of Empathy: This evidence-based classroom program delivered by trained professionals results in increased levels of social and emotional learning. Trained professionals will deliver specialized programs and services that promote health, education and social well-being for military families. Team Rubicon Canada: A sustainable mental health support program, as well as a community for Veteran and community volunteers trained in disaster response, will be established. The ASIST program will form part of the foundation for a self-sustained peer support network for volunteers. Veterans Transition Network: With expanded capacity for a group and peer-focused mental health program offered in French, complete translation services for all outreach, programming, organizational and clinical materials ensure equal level of care between French and English speaking Veterans. VETS Canada: Guitars for Vets provides guitar lessons for Veterans and currently serving members of the Canadian Armed Forces who have sustained a service-related injury. The program offers a peer-supported environment to reduce social isolation and social anxiety with the support of a guitar instructor. Winnipeg Military Family Resource Centre: The youth mental health well-being educational series will provide preventative, psycho-educational and experiential opportunities for youth and their families. Programming will help participants build self-esteem, as well as strategies for self-care, mindfulness and empowerment. Wounded Warriors Canada: Princess Patricia’s Canadian Light Infantry Association will provide Mental Health and Suicide Awareness Training including Mental Health First Aid. The program will share community resources and case studies related to suicide, challenges of transition, couples support and other mental health-related concerns. Legacy Place Society: Legacy Place Houses offer short-term, confidential housing for military personnel receiving mental health assistance and support during crisis situations. Houses are located in Calgary, Edmonton and Red Deer, Alberta. Mainland BC MFRC: “Surviving Sorrow II: Mothers of Fallen Soldiers Enlarging the Circle” will provide mothers of the fallen with the tools to prepare themselves and to communicate their experiences with other mothers media, schools, and military. Mood Disorders Society of Canada: Men’s trauma support program in Perth, Ontario, for military personnel living with PTSD. Moose Jaw MFRC: Families Over Coming Under Stress (FOCUS) provides resilience training for military families. The program was designed to help families develop skills to better manage the challenges that arise from military lifestyle, transitioning to civilian life and operational stress injuries. 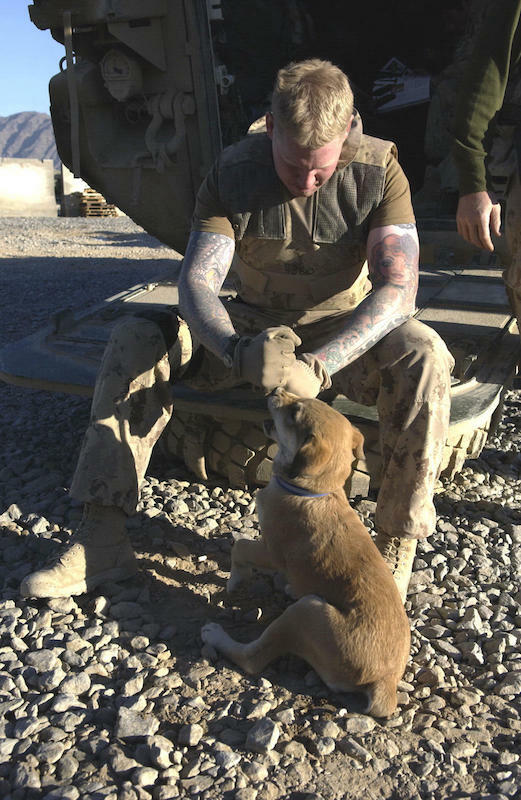 National Service Dogs: Certified Service Dogs for military personnel and Veterans living with PTSD based in Cambridge, Ontario. The Perley and Rideau Veterans’ Health Centre Foundation: This creative arts program promotes, maintains and restores the mental, physical and spiritual health of their Veteran residents. Prince’s Operation Entrepreneur: Entrepreneurial education, tools and resources for transitioning Veterans across the country who are interested in starting their own businesses. Funding will assist boot camp participants who are released due to medical conditions, such as PTSD, to find a new civilian mission and their own success. Roots of Empathy: This evidence-based preventative intervention program will help children foster their development of empathy and emotional literacy to reduce levels of bullying, aggression, and violence, and promote children’s pro-social behaviours to prepare students for responsible citizenship and responsive parenting. St. John’s MFRC: This equine facilitated treatment program will work to strengthen the resilience and enhance coping and communication skills for military families. Veterans Transition Network: This 10-day group-based retreat for CAF Members and Veterans is designed to help them overcome barriers to transition into civilian life. This includes counselling, OSI symptom management, psycho-education, peer-support and skill development in a group setting. Wounded Warriors Canada COPE Program: The Couples Overcoming PTSD Everyday (COPE) Program seeks to give hope to couples struggling with PTSD in their homes for a healthier and happier future. 4 Wing MFRC Society: The Applied Suicide Intervention Skills Training (ASIST) program offers workshops in Cold Lake, AB and surrounding communities to provide front-line workers and community members with intervention skills training. Equi-Sens: Based in Terrebonne, Québec, Equi-sens offers equine therapy for military personnel and Veterans living with PTSD and their families. 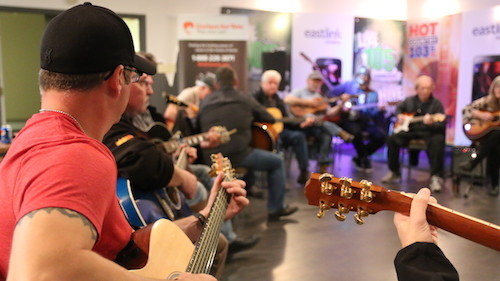 Guitars for Vets: Based in Halifax, Nova Scotia, this program offers peer support through guitar lessons and music therapy for Veterans with PTSD across Canada. Legacy Place Society: Legacy Place Houses offer short term, confidential housing for military personnel receiving mental health assistance and support during crisis situations. Houses are located in Calgary, Edmonton and Red Deer, Alberta. Mood Disorders Society of Canada: Women’s trauma support program in Perth, Ontario, for military personnel living with PTSD. PEI MFRC: A web-based peer support program for caregivers in military families across the province. Prince’s Operation Entrepreneur: Entrepreneurial education, tools and resources for transitioning Veterans across the country who are interested in starting their own businesses. Funding will assist the 74% of boot camp participants who are released due to medical conditions, such as PTSD, to find a new civilian mission and their own success. St. John’s MFRC, Newfoundland: A pilot equine treatment program to improve mental health resilience and enhance coping and communication skills for military families. Strongest Families Institute: Based in Halifax, Nova Scotia, this program provides evidence-based distance coaching to military families with children living with anxiety and behavioural concerns. This funding will support Canadian Rangers families in Northern Ontario, the majority of whom are Indigenous. Trenton MFRC, Ontario: In partnership with the Canadian Association for Marriage and Family Therapy, Trenton MFRC will deliver workshops focused on developing resiliency within military families. University of Manitoba: Classroom delivered Cognitive Behavioural Therapy with Mindfulness course in mental resilience, will provide training for mental health professionals and peer support staff to improve services for the military community in Manitoba. Veterans Transition Network: Clinically driven, peer support program to assist Veterans living with mental illness. This grant will allow VTN to expand the program in Québec and Manitoba. * All funding is directed toward Canadian Armed Forces members, veterans and their families. * Bell TPL Fund 2016 decisions were approved by the True Patriot Love Board of Directors at a meeting held on September 27, 2016, in Toronto, Canada.